All strange numbers are prime. Every one digit prime number is strange and a number of two or more digits is strange if and only if so are the two numbers obtained from it by omitting either its first or its last digit. Find all strange numbers. You will need to print one copy of this 2-100 master grid, and a copy of this sheet of smaller grids. On the first small grid, shade in all the multiples of 2 except 2. What do you notice? Can you explain what you see? Now update the master grid, by crossing out the multiples of 2 except 2. On the second small grid, shade in all the multiples of 3 except 3. Before you update the master grid, can you predict what will happen? Will you cross out any numbers that are already crossed out? If so, which ones? 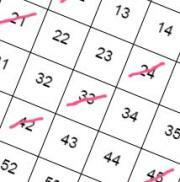 Now update the master grid, by crossing out the multiples of 3 except 3. Can you explain why some numbers have been crossed out twice and others only once? Use the next four small grids to explore what happens for multiples of 4, 5, 6 and 7. 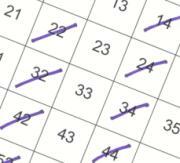 Before you shade in the multiples of each number (but not the number itself), try to predict what patterns might emerge. After you have shaded in the multiples, try to explain the patterns you've found. Before you update the master grid, try to predict what will happen. Will you cross out any numbers that are already crossed out? If so, which ones? After you have updated the master grid, try to explain why some numbers have been crossed out again and others haven't. Now look at the master grid. What is special about the numbers that you haven't crossed out? What would change on the master grid if you were to cross out multiples of larger numbers? We're used to working with grids with ten columns, but you might find an interesting result if you use this six-column grid instead. Can you predict what you will see? Try it! Imagine you want to find all the prime numbers up to 400. You could do this by crossing out multiples in a 2-400 number grid. Which multiples will you choose to cross out? How can you be sure that you are left with the primes? Imagine you want to find all the prime numbers up to 1000 by crossing out multiples in a 2-1000 number grid. Which number will you cross out last? With thanks to Vicky Neale who created this task in collaboration with NRICH. Mathematical reasoning & proof. Resourceful. Properties of numbers. Working systematically. Common factors. Prime numbers. Multiplication & division. Divisibility. Prime factors. Factors and multiples.